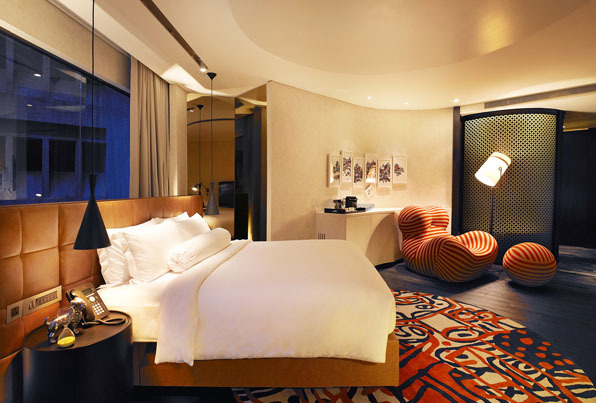 When you first step into the Naumi Hotel in Singapore, you get the distinct impression that someone is welcoming you into their own very stylish, tastefully curated apartment. 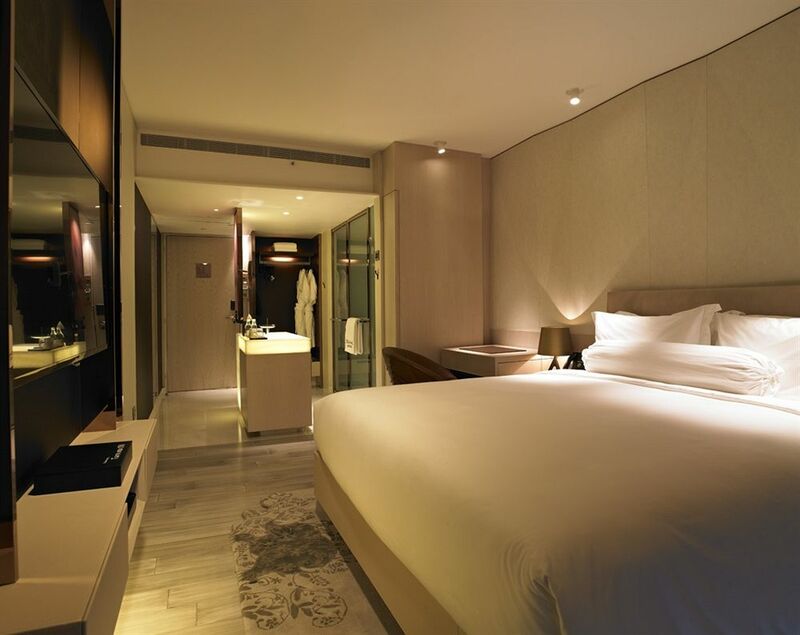 Which is precisely what the owners of the luxury boutique hotel were aiming for when they renovated the seven year old building tucked away in a quiet sidestreet next to the Raffles Hotel, and re-opened in October 2013. In the foyer, the friendly reception staff greet us by name and take us up to our floor, a sign of the “personal touch” service Naumi is famous for. Along the way, we walk past a video projection by contemporary visual artist Aiman, made up of thousands of different videos playing scenes of different times of day in Singapore, which combine together to form a smiling lady, who is the embodiment of Naumi herself. This theme is repeated throughout the hotel: on our floor, there is a captivating lenticular print artwork by local award-winning photographer and impressionist designer, Olivier Henry, that shows Naumi twirling gracefully. In fact, each floor showcases artwork depicting our hostess, Naumi, in her element, using different chakra colours. It’s not all seriousness though: Naumi’s signature tongue-in-cheek humour is also revealed on each floor, with the walls being painted with audacious, and sometimes naughty, sayings. The hotel itself has been re-designed to comprise 73 rooms in an eco-certified building, including the standard Habitat room, the Patio room (which is the same as the Habitat but with an outdoor patio), the opulent Oasis room (equipped with a bathtub), and four stunning suites with walk-in wardrobes: two named Eden and Nirwana inspired by Andy Warhol, and two named Gabrielle and Camellia inspired by Coco Chanel. The standard room sizes range from 26 sqm to 33 sqm, and thought has clearly been put into maximising the space available: wine glasses and coffee cups have been neatly tucked away in a cabinet shelf that slides out from the wall, and there is an bathroom sink island that also doubles up as a hightop table which can be used as a place to relax with a glass of wine. 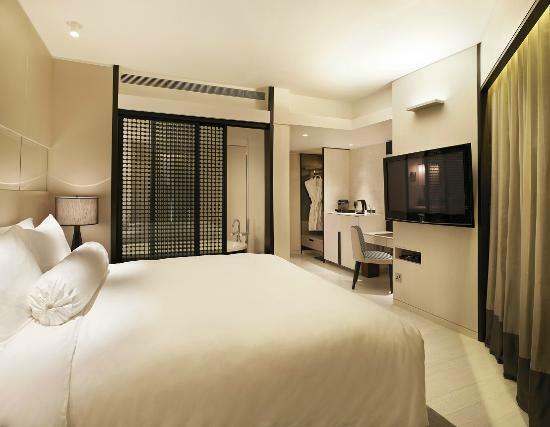 All rooms offer free mini bar drinks (including a serving of alcohol per stay), nespresso coffee machines, and tea. Another clever feature is the “magic glass” function that allows you to turn the adjoining glass walls of the bathroom opaque, in case you need some privacy whilst enjoying the Malin and Goetz toiletries. The Andy Warhol-inspired rooms are nothing short of entertaining: the vibrant colours all around the room pop, including a surprisingly comfortable red and white striped chair that pays tribute to the female figure (with an accompanying giant ball to rest your feet on). This, combined with the circular revolving screens around the enormous round bathtub, make it the perfect room for those looking for some fun. On the other hand, the Gabrielle and Camellia rooms ooze sophistication, incorporating the classic black and white palette of Coco Chanel, including a beautiful black lattice wood screen in front of the bathroom, a montage of photos in separate frames that combine to form a picture of a flower on the wall, and a stunning white trunk on which the Apple TV remote is found inside a box with the cheeky words “Turn me on” printed on the top. For those who are fashion lovers, you will find handpicked fashion books on the table, giving you the sensation that you are browsing through your hostess’ coffee table book selection. Up on the 10th floor, known as Cloud Nine, the first ever rooftop infinity pool bar in Singapore can be found (open until 11:30 pm every night), along with an infinity pool and reclining poolside lounge chairs. Hotel guests and their guests are allowed to use the pool, and private events can also be hosted on the rooftop, which has views of the Formula 1 and Singaporean fireworks. For those who enjoy Indian gastronomy, the Table by Rang Mahal restaurant can be found on the ground floor, which is a more affordable sister version of the fine dining restaurant under the same name on Raffles Boulevard. The curries are delicious (we highly recommend the sea bass curry), and the garlic naan is a must try. The breakfast buffet provided a simple range of food including a variety of eggs, cereal and standard hot choices, along with juices, champagne and hangover cures. The hotel’s concept of the hostess Naumi inviting you into her home is not merely an abstract philosophy: it was executed through the superb service, which meant that even after we had checked out, we were offered a hotel umbrella when it became apparent it was going to rain. For those savvy travellers looking for the comfort of a luxurious home away from home, with the warm hospitality that is sometimes missing from the larger chain hotels, we would highly recommend staying at the Naumi Hotel. The designer rooms (i.e. Gabrielle & Camellia and Eden & Nirwana) don't come cheap, at around S$580 (US$430) per night when we stayed there, but you can get their standard Habitat rooms around S$300 (US$225), so there is always the option to go for a cosier and more affordable option (or somewhere in between, with their Oasis and Patio rooms). Don’t forget that from 4:30 pm until 6:30 pm, the hotel also offers its guests complimentary unlimited alcohol from the lobby lounge. Absolutely amazing! Have low expectations of the gym - they were split into separate floors (with weights on one and cardio on another) and were tiny, with three machines on each floor. If you stay in the Gabrielle and Camellia room, be careful about the shower. For whatever reason, water leaked out from under the lattice wooden door all the way to the other side of our hotel room. While it didn't bother us, make sure you don't have any electronics or valuables on the floor before you use the shower. PS. This stay was a media stay, which meant that we received favourable media rates at this hotel. Don't worry though - we have a clear Disclaimer Alert Policy, which means that we don't lie to our readers (ever!) - so you can trust our review.